The main ideas presented in this work are an outcome of the Interreg MED project PELAGOS (Promoting innovative nEtworks and cLusters for mArine renewable energy synerGies in Mediterranean cOasts and iSlands). Since Blue Energy development is at its very beginning in the Mediterranean Sea, the aim of the paper is to present and discuss in depth the key-issues for a Marine Renewable Energy (MRE) cluster development in the Mediterranean and reveal its necessity for the commercial and sustainable development of Blue Energy in the area. This cluster is expected to stimulate the relevant Blue Energy sectors under the perspective of smart and sustainable growth. A healthy cluster is based on an efficient cluster policy. The main policy constituents (innovation, legislation and financial frameworks) are discussed taking into account the interrelated characteristics that are expected to specify the commercial development of MRE in the area. Key issues that can contribute to the establishment and acceleration of deployment of the related technological innovation are identified, and existent hindrances and challenges encountered in MRE sector are determined. The importance of solid financing instruments and strong collaborations among interested stakeholders is also highlighted for the viability of the MRE cluster. Finally, as an example of the cluster activities at a national level, the Greek Hub for Blue Energy is introduced. In this respect, aspects in terms of its structure and the services provided to its members are analyzed. The topic of renewable energy sources (RES) is an ever popular subject especially in an economic environment where fossil fuels have a leading role. Renewable energy is usually unlimited, conditioned to appropriate management, and, consequently, sustainable and drastically reduces greenhouse gasses emission. The clean and renewable energy resources of the world Ocean can be exploited in several ways. Therefore, the necessity for marine renewable energy (MRE) development is evident. The main types of MRE are offshore wind energy and ocean energy (sometimes called also Blue Energy1) that comprises energy from waves, tides/sea currents and thermal and salinity gradients; see (European Commission, 2014; Borthwick, 2016). Ocean energy is included in the five sectors of Blue Growth strategy that have a considerable potential to boost economic development and provide new sustainable jobs (https://ec.europa.eu/maritimeaffairs/policy/blue_growth_en). Offshore solar, marine biomass and ocean geothermal energy can be considered as emerging MREs. According to Appiott et al. (2014), offshore wind energy (OWE) is the most mature type of MRE regarding technological development, policy frameworks, commercialization and installed capacity. On these grounds, OWE is the most favorable type of MRE for the Mediterranean Sea (MS). Given the EU target of at least 27% energy generation share for RES by 2030, significant MRE development is expected to be achieved globally over the next few years. Although Europe is a global leader in MREs, current status in the MS is not yet favorable for reasons explained analytically in Soukissian T. H. et al. (2017). Probably, the most important problem refers to the different uses of the ocean space that induce challenges and conflicts of interest between stakeholders' activities and uses, and policy goals that can be resolved through mutual understanding, cooperation and efficient communication. Other hindrances as regards MRE development in the Mediterranean refer to the inadequate legal-regulatory framework, the financial instabilities encountered in some Mediterranean countries, as well as the lack of Marine Spatial Planning (MSP) and Integrated Coastal Zone Management (ICZM). MSP and ICZM are prerequisites for achieving sustainability and facilitating spatial demands by diminishing potential conflicts regarding the use of marine space. Within this framework the most competitive and influential public and private organizations related with the field of MREs should join efforts and form a transnational cluster under a common vision: to establish and promote Blue Energy (BE) sector in the MS and enable its potential in an integrated and environmentally sustainable way. In this work, the design and development of an efficient MRE cluster formation at a Mediterranean level is analytically discussed. Special emphasis is put on the cluster policy and the corresponding innovation, legislation and financial frameworks. To this end, the interrelated and multifaceted socio-economic characteristics of the Mediterranean basin are also described. These characteristics represent the most significant parameters of the geographical context in which offshore energy projects are to be implemented. As it is analytically discussed in Soukissian T. H. et al. (2017) and Boero et al. (2017), MRE development should be designed in an appropriate way so as to achieve economic viability and environmental sustainability, trying to harmonize three vital frameworks, not always aligned: the engineering, the ecological and the socio-economic one. Various aspects of these frameworks are also presented in Rodriguez-Rodriguez et al. (2016), Bray et al. (2016), Soukissian et al. (2016). An initiative toward these directions is the newly formed PELAGOS Mediterranean cluster. This cluster is expected to stimulate smart and sustainable growth in the MS through the development of BE and to accelerate the exploitation of the relevant technological innovation in the market sector. The structure of this paper is the following: In section MRE Potential and Status in the Mediterranean, the readiness level of MREs' technologies in the MS is reviewed in brief. In section Interactions Between Marine Renewable Energy and Marine-Related Economic Activities in the Mediterranean, the competing to the MREs uses of marine space are described (tourism, fisheries, maritime transport, and ports) and the relevant MRE value chain is presented. The next section Clusters' Key Issues for the MRE Sector in the Mediterranean introduces the idea of clustering and highlights the role of cluster policy as a tool for the efficient operation of the cluster. In section The PELAGOS Project and the Mediterranean Cluster of Blue Energy, the role of the PELAGOS Blue Energy Mediterranean cluster is described in detail. In the same section, the Greek Hub for Blue Energy (GH4BE), one of the national clusters that make up the PELAGOS cluster is presented, along with the activities and services that the GH4BE provides to its members. In the last section, some conclusions and guidelines are provided regarding the rational MRE development in the MS.
An extended review of the current status, main problems and challenges of MRE technologies along with some general directions for MRE development in the MS is provided in Soukissian T. H. et al. (2017). In Pisacane et al. (2018) the unlocking of MRE potential in the same basin is also highlighted as a necessity not only for energy production and independence (mainly of coastal areas) but for technology development as well. In the same study, the importance of BE translational clusters is emphasized as regards best practices and exchange of knowledge. These issues are analytically discussed here in sections Clusters' Key Issues for the MRE Sector in the Mediterranean and The PELAGOS Project and the Mediterranean Cluster of Blue Energy. As presented in both studies, there are several low-carbon technologies associated with the marine energy sector that can play a significant role in the fulfillment of the EU climate objectives. Taking into account the particularities and characteristics of the MS (e.g., rich coastal ecosystems, intense tourism, etc.) and the maturity of the BE technologies, currently two forms of BE seem to be the most propitious ones: offshore wind and waves. Although offshore wind is the most promising type with many consented projects, no considerable progress is expected before 2020. Based on the recent analysis of Soukissian T. et al. (2017) regarding offshore wind power potential (at 80 m above sea level) in the Mediterranean, it was shown that the Gulf of Lion and the Aegean Sea are the most favorable areas for offshore wind energy projects in terms of potential (with 1,050 and 890 W/m2, respectively). Taking into account bottom depth suitability, additional candidate areas include the Adriatic Sea and the Gulf of Gabes. In Boero et al. (2017), the Aegean Sea is highlighted as an ideal place for the installation of offshore wind turbines if additional restraints are considered (e.g., distance to shore, existing grid connection, sea-floor sediments, etc.). Wave energy technologies present a diversity of design concepts dependent on the water depths, locations and wave characteristics hindering their progress to a fully commercial stage. The mean annual wave energy flux in the MS has been estimated for different time periods and wave data sources by various authors; see e.g., Liberti et al. (2013); Karathanasi et al. (2015); Soukissian T. H. et al. (2017). Although the estimates for annual wave energy flux vary, the relevant assessments agree that the highest wave energetic area is the extended area between Sardinia and Balearic Islands, with around 9.5 kW/m according to Karathanasi et al. (2015). Other productive areas are the Levantine and the Ionian basins, the central-northern Aegean Sea and the area between Sicily and Tunisia. The exploitation of offshore wind and wave energy is also at the center of attention of the recently released report (EC Directorate-General for Energy et al., 2018) of European Strategic Energy Technology Plan (SET Plan). Two out of eleven adopted implementation plans (IPs) refer to BE, namely: (i) innovative for global leadership in offshore wind, and; (ii) initiative for global leadership in ocean energy. SET Plan is looking to expand the contribution of offshore wind energy in the total power supply coming from wind, which is expected to be 240–445 GW by 2030. The implementation plan is mostly committed to make this type of energy cheaper and more competitive. Thus, innovation is deeply encouraged in an attempt to find cost-effective ways for installation, operation and maintenance works. For instance, for the period 2018–2022, 10 M€ is estimated to be devoted in digital transformation in order to improve energy yield. Forecasts for the period 2018–2025 anticipate that 350 M€ is going to be devoted in the construction of large turbines able to produce more energy and harvest wind in lower speeds. The second implementation act regarding ocean energy is focused on the creation of a supply chain that could take advantage of the most advanced ocean technology present in Europe aiming to generate jobs and wealth. This supply chain will need new infrastructures, logistics and installations, which should be preferably, placed near the energy sources. Implementation plan also works in the development of a cooperative mentality, as coordinated actions are required in fields related to: (i) certification and safety standards; (ii) standardization and creation of guidelines for the evaluation of wade and tidal technology, and; (iii) promotion of a system that shares open data. Investment needs for the proper implementation of the above acts are estimated to reach the amount of 1,240 M€ by 2030. BE is the current generation of renewable energies with the potential to become a new South-European industrial sector. However, the concentration of renewable energy installations is clearly identified in the North and Baltic Seas, and in the European coasts of the Atlantic Ocean. Many opportunities also exist in the Mediterranean basin and, following EU targets, action is needed in order to be revealed. A first step toward this direction is to highlight the anticipated interactions between MRE development and other activities in the MS. The MS is characterized by important economic activities (coastal tourism, fisheries and aquaculture, maritime transport, etc.) and thus, the strategy of MRE development should account for the potential conflicts and impacts that may raise. In any attempt for MRE development in the MS, the preservation of the good status of coastal and marine ecosystems is of first priority. On the other hand, the range of interactions between MRE and other marine uses, and the cumulative impacts of their pressure to ecosystems are hard to be determined at a first sight; evidently, it is rational to reinstate the operating principles of the main maritime sectors targeting to sustainability and efficiency. These values and principles will hopefully portray the future actions of the first Mediterranean cluster being developed under the framework of PELAGOS project; see section The PELAGOS Project and the Mediterranean Cluster of Blue Energy. In this connection, a general guideline is enacted in advance in order to: (i) qualify and treat the exploitation of MRE as the most sustainable and healthy way to produce energy; (ii) regulate the conflicts of interest arising from the overlapping use of marine space; (iii) fairly compensate potential negative aspects of MRE installations and mitigate social oppositions. Since OWE will soon start developing in the MS, the co-existence of other activities with offshore wind farms (OWF) is a subject of discussion and specific recommendations are provided in a way that the aforementioned sustainability and efficiency can be attributed. Since the rational exploitation of MRE is the most sustainable and healthy way to produce energy, this can be achieved by harmonizing conflicting frameworks that are evident during the design of an OWF. The coexistence of OWFs with aquaculture is an indicative example: with the appropriate information campaigns, consultation activities and incentives, conflicts can be mitigated between the involved stakeholders. Additional examples are provided in the forthcoming sections. In a study by WWF (Piante and Ody, 2015) regarding the marine-related activities taking place in the MS, the necessity for a long-term vision for sustainable development has been emphasized, built upon the Barcelona Convention. In February 2016, the revised Mediterranean Strategy for Sustainable Development (MSSD) for the period 2016–2025 has been adopted. This Strategy was formulated through an inclusive process that involved key regional and national stakeholders. One of its main aims was to identify the specific direction that should be followed for the wellbeing of tourism, maritime transport, aquaculture and other sectors, affecting and involving, directly or indirectly, MRE sector as well (see next sections). In principle, the degradation of ecosystems and loss of biodiversity, the insufficient legal instruments that support sustainable development and climate change adaptation (mentioned in the revised MSSD) should be also taken into account in offshore wind energy projects. For further information on MSSD and the Barcelona Convention, see (UNEP/MAP, 2016)2, respectively. In the Mediterranean region, tourism activities are connected with a variety of recreational and business purposes and are mostly coastal oriented with dramatic increases during July and August. According to World Travel Tourism Council (2015), Mediterranean tourism offers 11% of total employment and contributes by 11% to the regional GDP. As it is noted in Fosse and Le Tellier (2017), Mediterranean area is a favorable destination in terms of both international and domestic tourism (more than 300 million International Tourist Arrivals), with a forecast of 500 million by 2030. Nevertheless, major problems such as the economic leakage through the unbalanced distribution of tourism-generated revenues, and the overconcentration in coastal areas accompanied with negative environmental impacts cannot be neglected. These conflicts may be mitigated if the belief that competitive tourism must be based primarily on environmental sustainability is cultivated. According to the main framework of the MSSD 2016–2025, long-term targets and key guidelines should be followed in order to deal with the issues identified above. The good environmental status should be the milestone of the strategy, promoting a premium model of ecotourism where tourists are willing to pay in order to be familiar with the cultural and the environmental wealth of the Mediterranean coasts. Carefully selected islands could constitute preferred demonstration regions for any innovative MRE projects. The compatibility between MRE sources and sustainable tourism development in the MS has been studied in Michalena (2008). Potential negative effects of OWFs in coastal tourism and in particular the visual noise effects have been discussed analytically in Boero et al. (2017). The potential beneficial interventions of MRE projects, many of which have already been successfully tested in ecotourism, are the following: (i) power supply of local authorities and other infrastructures (hotels) can be provided by MRE; (ii) MRE installations can be used as thematic parks attracting alternative tourism. The habitats developed under MRE installations can be served for diving purposes; (iii) exhibition centers, such as marine museums, aquariums, etc., can be constructed near the OWFs' areas. Evidently, all these possibilities should be taken seriously into account as they create positive externalities for the nearby communities. As it is stated in Food Agriculture Organization of the United Nations (2016), fishing industry provides about 220,000 jobs (employed on fishing vessels) and is therefore considered a main pillar of the Mediterranean economy. In the same reference it is highlighted that commercial fishing remains a valuable coastal industry for many countries including Italy, Greece and Spain. The increased demand for sea space dedicated to future MRE developments will also impact this industry. Consequently, as De Groot et al. (2014) mention it is necessary to consider efficient ways in order to harmonize future MRE and fisheries co-existence. The diverse morphology of the basin is an important sustainability factor that regulates the fishing activity as well as the impacts of future MRE projects in the entire region. Fishing in the MS may take place on the continental slope, while, most usually, is concentrated in depths up to 400 m and in nearshore areas (Piante and Ody, 2015; Food Agriculture Organization of the United Nations, 2016). Therefore, the installation of OWFs is less likely to be in conflict with these activities. Nevertheless, each area has its own particularities, obstacles and difficulties as well as strengths and opportunities may vary depending the case. Potentialities and opportunities (e.g., no-fishing areas, artificial reef effect and alternative employment) must be carefully adopted and used against oppositions. See also (Boero et al., 2017) for a detailed discussion. In the recently published review (United Nations Conference on Trade Development, 2018), the significance of the maritime transport is highlighted. Board ships are the main mean of transport, carrying 80% of global trade by volume that subsequently is being handled by seaports. As it is mentioned in Piante and Ody (2015), hundreds of these activities are taking place in the waters of MS and therefore maritime transport presence is intense in the area. Also, some indicative and self-explanatory numbers, regarding maritime sector in the area of MS, could be the 550,000 direct jobs provided and the noteworthy participation of 21 ports in the list with the 100 world top ports. Maritime transport is not an opposing activity to MRE development; on the contrary, maritime transport sector with ports at its center is bringing revolutionary ideas in harnessing MRE sources. Following the maturation of OWE and taking advantage of the declining costs, ports have started to transform their infrastructures in a way to support OWE and the entire supply chain contributing thus to cost reduction and efficiency (Wind Europe, 2017). For instance, large available spaces, found mostly in the yard, can be either used as warehouses or for training purposes (staff, visitors, etc.). Furthermore, their location facilitates the transportation of large components, avoiding not only a huge transportation cost but also many other incurred risks related to transport. Moreover, a survey conducted by the European Sea Ports Organization (2016) revealed that 38% of port authorities are facilitators of renewable energy production in the port while 16% are even investing or co-investing in renewable energy production. Evidently, MRE can be used in ports for cold ironing3 purposes, while ports are expected to play a key role in MRE development, as they are becoming breeding grounds for blue technological innovation. Overall, MS space can be exploited in many efficient ways, if a certain MRE mentality is to be adopted in its activities. It is also essential to explore the nature of the value chain mechanism that governs these activities in order to estimate correctly the range of these opportunities. Value chain analysis focuses on the examination of the core and supportive activities of a project in an effort to understand costs, locate the activities that contribute the most in the generation of adding value, and differentiate the project from the competition. It facilitates the search for synergies among sectors of different, but related, market subjects while it also provides a measurement to the stakeholders, as regards the externalities developed among sectors to the local and regional economies. Thus, it sets a basis for discussion around controversial issues and targets that should be met in the future. Considering a particular BE project, e.g., the installation of offshore wind turbines, the relevant value chain reflects most of the life cycle of the project: it goes from the design and preliminary assessment phase that includes resource assessment, environmental impact assessment studies, design of the infrastructure, permitting processes, etc., continuing with the manufacturing including feasibility studies, testing in scientific labs, etc., the installation (e.g., assembling of different components, transmission of infrastructures, etc. ), the grid connection, the operation and maintenance of the farm, and the decommissioning phase. The intervention of other actions, such as interpretation of regulatory frameworks, financing plans, risk assessment, logistics, etc., need also to be considered for the efficient implementation of the offshore project. This extensive BE value chain analysis, along with the identification of potential key players in the field, leads to the pathways for clustering aiming at the prompt and rational organization of all actors that will be involved. These issues have been analyzed in the Interreg BLUENE project (http://www.medmaritimeprojects.eu/section/bluene). In an environment where the demand for renewable energies, and especially of BE, is continuously growing, a new strategy plan is adapted in the EU member countries. The pillars of this plan are based on the synergies among different stakeholders involved in the BE value chain. The necessity of fostering teamwork and collaboration in and between companies and institutions has been described by many economists as the primordial factor that determines their competiveness and innovation level. In the case of BE market/value chain, it is evident that any collaborative scheme should be applied in an extended geographic scale/region. According to the definition of Porter (2008), clusters are “geographically proximate groups of interconnected companies and associated institutions in a particular field, linked by commonalities and complementarities.” Cluster members could be suppliers, service providers, firms in related industries, universities and research centers, etc., that are competitors but at the same time cooperators. Clusters are considered the most practical and profitable formations under which a large variety of marine-related sectors could be implemented. Moreover, the idea of clustering is entirely harmonized with the vertical integration concept, which drastically changed the status quo of economy in the early 20's. Until today, it continues to dominate the majority of economic activities. Economies of scale, outsourcing plans and value adding activities are the most eminent features of its application. In an era where the shifting nature of competition is increasingly driven by knowledge and skills, clusters play a fundamental role in the dissemination of knowledge and innovation, and the accumulation of skills. In this way, clusters represent the dedication to expertise as a rational alternative to low cost labor and low quality solutions. Usually clusters emerge spontaneously triggered by a major event, turmoil, necessity, etc. The question that arises here refers to whether this spontaneous creation of clusters, responding to market signals, should be left to develop naturally. In our opinion, the potential accumulation of benefits from positive externalities previously distinguished creates a strong rationale for cluster policy that should regulate the activities of a sustainable renewable energy cluster. Given that there is no international instrument to cope with all potential elements of energy governance in the context of a cluster (Steffek and Romero, 2015), it is more probable to face a multi-level governance system extending in overlapping areas (Goldthau, 2014) since (i) MRE's regulation is spread across various areas of international (and national) law; (ii) diametrically opposed interests are arising from the implementation of institutional arrangements, and; (iii) main actors in the RES landscape are often geographically widely dispersed and isolated as regards potential collaborations (Jaegersberg and Ure, 2017). Recently, the orientation of clusters has been significantly altered. A “top down approach,” defined as the situation where economic opportunities are driven to industries (small & medium enterprises/SMEs) with little existing business culture, is being adopted4. The renewable energy market with its dynamic changing business landscape is becoming more competitive and less predictable at the same time. Obviously, it becomes imperative for policymakers to be aware of existing obstacles and opportunities on time in order to create the conditions for the prosperity of a value added cluster. In macroeconomic level there exist, in theory, rational guidelines regarding issues that concern policies and strategies for the development of clusters (e.g., the diamond model; Porter, 1998, 2011). However, when this knowledge is to be applied in more dynamic conditions, we come across with deficiencies of the theory and resistances in its implementation. As it is noted in Atkinson and Audretsch (2008), the realization of economic value in clusters are affected by barriers and enablers on the ground. The design and construction of cluster policy that confronts deficiencies could commence with the adoption of basic principles from a broader strategy in transnational level. Best practices already tested in a wider European extend, combined with the experience from the confrontation of recurring barriers identified in RES clusters, could provide useful guidance and should be seriously taken into consideration. For instance, MSSD could be used as a starting basis for the smooth assimilation of sustainable development into the corresponding strategies of the Mediterranean EU member states. The provision of its tools and suggestions, under which interconnected levels of government are operating, could be a huge assistance in the formation of the cluster policy. The framework, shown in Figure 1, is proposed as the backbone of cluster's policy formulation that will accompany any attempt for cluster establishment and maturation. Subsequently, useful lessons and experiences coming from recurring barriers will frame this scheme. Figure 1. Main constituents for a rational cluster policy. The general strategy perfectly aligned with the needs and the aim of a sustainable MRE project is the MSSD 2016–2025, which addresses important issues extending in the edge between “environment” and “development.” It is anticipated that MSSD will establish and reinforce synergies between the activities of different stakeholders relevant with the BE value chain. It is also anticipated that MSSD will provide a common framework, in order to render efficient the implementation of sustainable development, (UNEP/MAP, 2016). In this connection, issues that should be addressed originate from sectoral, institutional and legal limitations, referring also to environmental aspects and socio-economic challenges. An overview of the current socio-economic and environmental impacts along with guidelines for the sustainable development of MRE in the MS is provided in Soukissian T. H. et al. (2017). These impacts should be considered before delving deeper into the policy perspectives of BE. In real world, recurring barriers are identified in the majority of clusters. In this work emphasis is put on SME-related issues considering their important contribution to job and wealth creation. 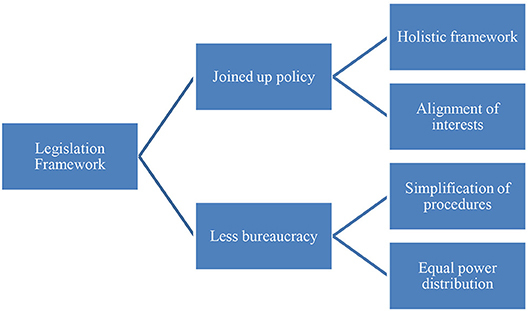 A better understanding of the linkages between stakeholders is of critical importance in order to extract valuable conclusions for the design of cluster policy and functioning. As it is noted in Jaegersberg and Ure (2017), the identification of recurring barriers is clearly expressed through paradigms of different renewable energy clusters. This is necessary in order to understand the issues that arise in different contexts and highlight their value creation in clusters. Unfortunately, value creation is currently not receiving the appropriate attention from policymakers. 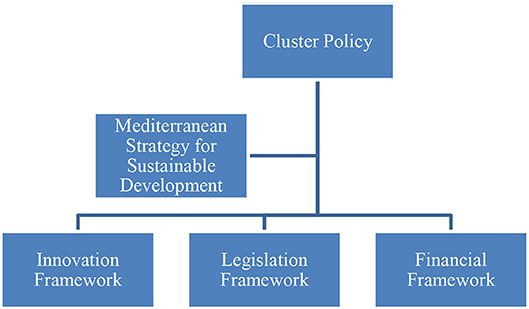 Even some of the examined clusters are out of Mediterranean region, their contribution to define the first steps of cluster policy is decisive. The following examples are analytically discussed in Jaegersberg and Ure (2017). The Baixo Alentejo PV cluster in Portugal adopted a “top down” approach in an environment lacking of real business culture and well-established networks of communication and coordination between the players. The most important difficulty was due to the restricted opportunities for SMEs to engage constructively with other stakeholder groups. The problems faced and the complaints raised by small-scale producers in their attempt to install solar products, when this was asked, can be summarized as follows: (i) Large enterprises and government shared power and influence; (ii) Bureaucratic issues combined with lack of transparency and safety; (iii) Lack of SMEs real representation in decision making; (iv) Universities and R&D institutions preferred to run research projects with large companies refusing at the same time to generate shared value from SME niche knowledge. The Canadian Case in Alberta pictures the attempt of an early stage RES cluster to compete against well-established companies that produce electricity via fossil fuels in a supposedly liberalized electricity market. The reality, however, was quite different from the investors who tried to break the “monopoly” of fossil fuels. Incentives such as Feed-in Tariffs (FiTs) and quotas were absent in Alberta whereas neighbor regions were providing more favorable investment regimes. The differentiation in energy policies along with the cost efficient production of energy from oil and gas producers created harsh conditions for the cluster. The main problems that the involved SME's identified, referred mainly to the uneven level playing field, through unfair competition between RE and oil and gas companies, bureaucratic issues, shortage of long-term policy and of expertise in the sector of renewables, and the limited participation of SMEs in decision making procedures. The German PV cluster faced recurring barriers of economic nature. The cluster was initially rapidly grown driven by the mechanism of FiTs and special funding programmes and Germany met a record rise in installations. According to EPIA (2012) Germany had the biggest PV share in a global level (24.7 GW capacity). A remarkable augmentation in the demand of solar panels though had a major effect in cost, enough to signal a governmental adjustment in the framework of FiTs. The majority of SMEs opposed to the change, stating that PV could not support itself without FiTs, as extra amounts of money directed to R&D incentives were indispensable. Combined with the increasing competition from China and low-labor countries, SMEs found themselves disproportionately penalized at the forefront of innovation. Eventually, there was a significant distortion of the market as a result of cheap imports and that Chinese companies took advantage of the less restrictive environmental standards and regulations, and the cheaper labor costs. In Figure 2 the main necessities for an efficient legislative policy are summarized: (1) a joined up policy that should encompass a holistic framework, which caters the interest of individuals and the alignment of interest of the involved stakeholders, and (2) the minimization of bureaucracy, leading to simplification of procedures and equal distribution of power among the shareholders. Lack of joined up policy and bureaucracy resists tightly to any positive change due to deep rooted habits and mechanisms. Figure 2. Cluster policy: visualization of concept for legislation framework. Clusters need to become accustomed with new ideas and business models in order to face key aspects of legislative issues concerning mostly the lack of joined up policy and the delays faced in its implementation. The most profound problem concerns the willingness of national and local authorities to adapt in these new business models, which make the whole process more cumbersome. Their arrangements, laws and actions are often hindering the smooth operation of necessary activities toward BE growth by causing conflicts of interest (overlapping issues, etc.). Another problem concerns the interests of disparate groups, often intensified in early stage clusters where the collaboration scheme involves different administrative bodies. In this direction, the efficient revision of national, and at a next phase transnational, policies and the integration of environmental, socio-economic, technical, and legislative considerations into a single holistic framework is necessary. Although harmonization and integration of regional, national and transnational policies is not easy, it is of crucial importance in order to mitigate the above-mentioned problems. A legislative and regulatory infrastructure aligning the different interests and point of views, and assessing all the political ramifications is complex to be designed and hard to synchronize. Realistic and necessary steps in facilitating a joined up policy that boosts MRE development in the area are the following: (1) governance support; (2) centralization and decreasing of the permitting bodies to the less possible number; (3) composition of a comprehensible document which summarizes and simplifies the licensing and permitting procedures, and; (4) countenance of activities that promote synergies among European stakeholders (improvement of regulatory frameworks, creation of platforms, coupling of private and public sector through partnerships). For a discussion on these issues see also (Soukissian T. H. et al., 2017). Legislative gaps and delays of the kind described in the case of Portugal cluster constitute a considerable barrier to cluster performance. Cumbersome bureaucratic issues are frequently encountered during different stages in the implementation of a MRE project. Companies' efficiency is closely dependent on the degree they can surpass these issues. However, as it is noted in Garbe et al. (2012), the footprint of these issues may not be necessarily negative, as some organizational and geographical constraints are acting beneficially to some clusters. A conclusion from the study of RES cluster cases is that bureaucratic issues are often being created by default, rather than by design or intension. Newly created clusters or clusters with high participation of SMEs in their composition are characteristic examples of this situation. For example, in Portugal, bureaucratic procedures excessively impacted SMEs that participated mostly in system installations. Additionally, a lot of SMEs with tight margins found difficult to dedicate time and resources to fulfill administrative tasks and also to apply for funding. Finally, there are cases, like the Canadian one, where SMEs felt that the design of the cluster and the process itself was not created based on their needs, leaving hints for un-even competition and distortion of the market. Science is a prominent key to success; sometimes, however, it is mistakenly sidelined by other relevant or irrelevant activities. “Innovation policy” (“smart growth”) in a broad extend refers to the materialization of new ideas and their diffusion in the economic and social system. In other words, innovation policy attempts to influence and shape activities, often with the purpose of increasing economic growth. In an attempt to design Europe 2020 strategy, two important initiatives have been developed and adopted by the European Commission (EC): (i) the “Innovation Union” flagship initiative (https://ec.europa.eu/info/research-and-innovation/strategy/goals-research-and-innovation-policy/innovation-union_en), and (ii) the “Regional Policy contributing to smart growth in Europe 2020” (European Commission, 2010) that concerns smart specialization and growth. 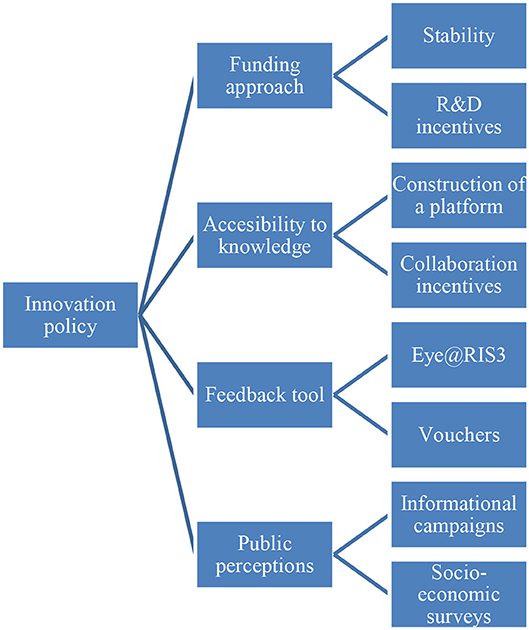 The main constituents of innovation policy are summarized in Figure 3, which depicts the sequence of actions that should be followed. Initially, a long-term, efficient and stable funding strategy will enhance for granted collaborative schemes and will benefit the creation of new jobs. This collaboration, in turn, implies the existence of certain places, such as online platforms, equipped with effective tools that are working toward both the facilitation of those initiatives and the interaction with the societal part. Figure 3. Cluster policy: quadruple axis of innovation policy. Clusters that inherently support regional cooperation between diverse innovation actors, provide a favorable ground in which objectives set from the aforementioned consultations could be applied. Barriers and challenges also identified will help to detect the actions needed in order to develop a rational, cluster-based, innovative policy. In the medium term, clusters act as efficient platforms disseminating the good practices and maybe even later could be used as a guideline for the design of transnational innovation policy. To start with, the concentration of key players with high experience in the BE sector shall be at the top of the agenda of this innovation system. In the Canadian case, the lack of experienced scientific staff was underlined, while in the German cluster a fear was expressed that mechanical engineering enterprises, suppliers and R&D institutions would move to places with higher perspectives in terms of salaries. The absence of a long-term funding plan, apart from the oncoming insecurity and instability to the concerned parties of a RES project (investors, scientists, institutions, SMEs, etc. ), is the most eminent and recurrent issue that affects the development of RES clusters and subsequently, the whole process toward blue growth. Another important issue that innovation policy has to deal with is that the existing practical knowledge and scientific findings are rarely concentrated in one database or platform, rendering it inaccessible to many stakeholders. A full exploitation of capabilities provided by universities and R&D institutions presupposes the collaboration between them and the stakeholders within the cluster. However, as stated by Jaegersberg and Ure (2017), the reality is hardly ever that ideal. Instead of generating shared value, it was noticed that the connection between universities and SMEs formed barriers in key areas like the German case, where universities were perceived having dissimilar goals and operation procedures from SMEs. Clearly, incentives and ways of working together should be cultivated as well as a transfer-knowledge platform must be created. This collaboration is in agreement with MSSD and the general European vision to build on strengths and comparative advantages originated from SMEs in relation to R&D SMEs. An aftereffect of the need for collaboration is the development of the Strategic Research and Innovation for Smart Specialization (RIS3), which is a requirement in order to receive funding from the European Regional Development Fund (ERDF) (https://ec.europa.eu/jrc/en/research-topic/smart-specialization). In Sörvik et al. (2016) it was shown that some EU member states changed their attitude regarding collaboration on R&I due to the new cohesion policy, with the majority (67%) having increased cooperation the past two years. Directly intertwined with the necessity of an online platform is the construction of a business tool that allows timely feedback to those developing and applying policies. The Eye@RIS3 for example (http://s3platform.jrc.ec.europa.eu/eye-ris3), as a part of the Smart Specialization Strategy Platform (S3P), has been developed as a strategic tool aiming to highlight and distribute knowledge among users. By updating the database with regional/national priorities, a high-quality feedback is obtained in topics related to European Innovation Partnerships, projects (H2020, Interreg MED), thematic workshops, etc., enabling others to find their niche in the market and search for potential partners to develop collaborative schemes on certain topics. Eye@RIS3 can be used also as a benchmarking tool allowing comparisons between RIS3 and R&I specializations in order to understand the innovation strategies of other countries or regions and identify competing niches. A successful innovation strategy should look after for the settlement of more qualitative targets clearly expressed in the Europe 2020 strategy structured to create new job offers and to deliver a sense of direction to the society. Job offers seem to be achieved through voucher initiatives, recently gaining space in many countries, with the following two-fold impact: (i) permitting SMEs to share their problems related to innovation with knowledge providers, and; (ii) providing incentives to public knowledge provider to collaborate with SMEs. Finally, the innovation policy should necessarily deal with the problem of social acceptance. Again with the contribution of governance support, innovation must ensure the supply of high educated citizens. Informational campaigns and training platforms must be designed in an attempt to raise environmental awareness of the local communities. A certain feedback through socio-economic surveys, during the design phase of MRE projects, along with public consultation procedures should also be adopted. Most of cluster's efforts have instinctively focused on finding effective financing tools to ensure the diversification and health of their economic activities. During the last decade, many researchers have tried to spot the hindrances encountered by RES projects in getting and appropriately managing funding. These barriers have their roots in “systemic” and “non-systemic” problems. “Systemic” problems will unavoidably appear and are related with politic/policy decisions and issues. “Non-systemic” problems refer to the barriers that stem from the insufficient awareness that characterize stakeholders regarding the existing financial institutions and funding instruments along with the risks and opportunities associated with them. Another side of “non-systemic” problems is the technological one. Specifically, a great mix of problems takes place such as lack of experience in terms of scientific research, new types of sponsors and business models, rendering private investors reluctant to fund innovative projects. The organization of a financial policy around clusters is a challenging task. It aims to elucidate topics related to funding instruments and regulate governmental resolutions regarding public-private partnerships, Foreign Direct Investment attraction plans, tax rebates plans, favorable bank loans, etc. In this way clusters would become an organizing principle to integrate different economic policies, overcoming the obstacles that characterize each national economic policy. These issues have been also discussed in the financing strategy of MSSD 2016–2025, where the allocation of funds and the mutual involvement of shareholders is underlined as the most beneficial action toward the implementation of the financing strategy directions. These actions may embrace the construction of projects' portfolios or even the organization of fundraising activities during capacity building seminars and workshops. The Strategy also highlights the significance of the engagement between private and public sector. It also visualizes the creation of an independent investment facility that simplifies the economic framework by embodying many international institutions in an attempt to boost MRE investments. A steady economic environment favors investments and facilitates projects of greater scale and incentives. A transparent political scene committed to a long-standing relationship with RES, which leaves little space to uneven competition, is a prerequisite. Market has detected the absence of a reliable mechanism able to reduce regulatory risks and cost of capital and hence, bring back confidence to its actors. Therefore, tax rebates plans and the issuance of power purchase agreements, for countries where no FiT system exists, are measures of critical importance. Perceived risks of investors are necessary to be abridged. Ideally these proclamations will be used as inputs in tools like Eye@RIS3, giving a general guideline to the innovation policy. Finally, clarity, simplification, transparency and equal access to information is a challenging task taking into consideration the extended coordination required in a multi-institution level. To qualify a financial policy as stable, a plan, full compliant with legislative policy, is imperative. Tremendous assistance in this effort provides the EC simplification handbook (http://ec.europa.eu/regional_policy/sources/docgener/factsheet/new_cp/simplification_handbook_en.pdf). EU provides a big variety of public or private financing instruments targeting the RES field particularly through the European banks IEB and EBRD and the European fund organizations (ERDF, CF). The type of MRE, as well as the stage of development of the technology, will determine the choice of the most suitable financing instrument. 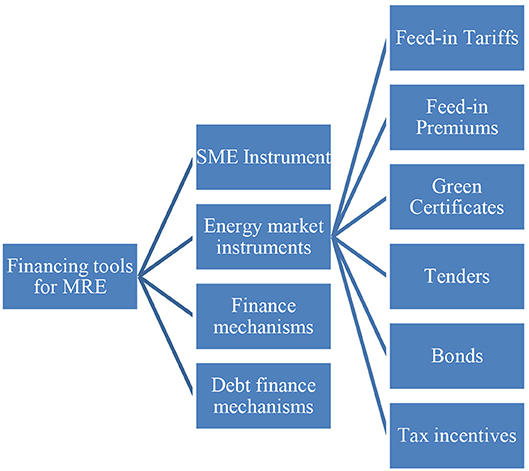 In Figure 4, the financing instruments that are available and can activate and accelerate the development of MRE are presented, namely: (1) SME instrument; (2) Energy market; (3) Traditional financing tools (R&D Grants, venture capital, etc. ); (4) Debt financing. Special reference is made to the SME instrument and the financing directly from the energy market. SME instrument is the dominant financial incentive provided by EU for SMEs. With around 4,000 SMEs being selected to receive funding the last three years of its implementation, it can be considered the dominant financial instrument for SMEs. Figure 4. The financing tools for MRE. SME instrument. It was launched on 2017 as part of the Horizon 2020 (H2020) work programme (http://ec.europa.eu/research/eic/index.cfm). SMEs, either based in EU or established in a country related to H2020, have the potential to get funding for their innovation projects. The instrument has already provided a huge incentive to SMEs, by supporting the most impactful and groundbreaking ideas with the amount of €1.6 billion over the period 2018–2020 (https://ec.europa.eu/programmes/horizon2020/en/h2020-section/sme-instrument). Its aim is to give an innovation boost to the existing market and disseminate the projects' outcome in an international level. Specifically, the SME instrument is fulfilled in two or three phases. Phase 1 (feasibility assessment phase) is optional and provides the assessment of the technical feasibility and the commerciality of the project. A lump sum of €50,000 per project is granted and the duration of this phase may typically be around six months. In Phase 2 (Innovation Project), the indicative range of funding fluctuates between €500,000–€2.5 million or more, covering several activities like prototyping, design, testing, etc. This phase is also the most time consuming and it may vary between 1 and 2 years. In the framework of Phase 3 (Business acceleration), SME instrument proposes business acceleration services like linking with private investors. Finally, coaching service is being offered to SMEs by experienced business coaches, selected through the Enterprise Europe Network during phases 1 and 2 in order to ensure the sustainability of their projects in terms of strategy and innovation. Coaching and mentoring services are in progress, in an attempt to prepare SME for a pitching with investors to access potential funding. These initiatives are placed under the umbrella of finance mechanisms, some of which are described in the rest of this section. For other financial instruments, see (http://www.eib.org/en/products/blending/innovfin/products/index.htm) for InnovFin loans, (https://ec.europa.eu/growth/access-to-finance/cosme-financial-instruments_en) for COSME and (http://ec.europa.eu/regional_policy/en/funding/financial-instruments) for European Structural and Investment Funds. Energy market instruments. FiTs were the first implemented mechanisms of public support. Incessant retail prices are being secured for RES plant operators for a certain period while from policy perspective, FiTs constitute the most stable and predictable instrument (see also Held et al., 2014; Ren21, 2014). As presented in Hogg and O'regan (2010), FiTs can be financed through tax revenues; alternatively, market participants (e.g., electricity suppliers, network operators, etc.) can adjust FiT costs among corresponding consumers. A fact worth mentioning is that countries that have adopted tariff systems have proven records of lower cost of capital in comparison with the ones that implement different instruments and involve higher risks in MRE projects. Despite the aforementioned advantages of FiTs, the price-driven nature of this instrument does not match with the policy of many countries. Recently some countries have decided to move to auctions bidding process (FiP) as a way to distribute renewable energy capacity. A recent overview of the FiTs in the European Union can be found in Cointe and Nadaï (2018) and (http://www.res-legal.eu/). FiP systems are used as the main support instruments in Denmark and the Netherlands, while in Spain premiums and tariff system co-exist. The level of premiums is based on future expectations regarding the cost of electricity and the average market revenues, thus embodying risk of inducing additional costs for society and windfall profits for producers when production costs are over-estimated. In most cases, reduced tariffs have been achieved with this bidding process in comparison with previous incentives (Frankfurt School-UNEP Collaborating Centre for Climate & Sustainable Energy Finance and Bloomberg New Energy Finance, 2018). In the guidance of the renewable energy support framework adopted by EU (European Commission, 2013), it was suggested that FiPs, along with other support mechanisms, should take the place of fixed FiTs since the former are more rational, adaptable and able to support schemes that can lead to lower production costs. The pros and cons of fixed FiTs and FiPs are discussed in Bigerna et al. (2015) and De Jager et al. (2011). Quotas obligations and tender schemes are currently based on fixed quantity instead of a fixed market price for electricity. According to Schaeffer et al. (1999), green certificates (GCs), the most well-known form of quotas obligations, are created by the producers of electricity, having a two-fold purpose: (i) to verify the implementation of obligations, acting as an accounting system, and; (ii) to facilitate electricity market from RES, leading to the establishment of a GC system for renewable electricity apart from the market of traditionally produced electricity. The GCs, bought from the producers of RES electricity, become valuable for the corresponding consumers since penalties are set to them if they do not fulfill the energy targets within specific period of time. Due to this increase of GCs supply and the competition between the producers it is foreseen that there will be a fall as regards the price of RES electricity. For this reason, GC are characterized as an efficient way to satisfy RES target. Government tenders, the second scheme of fixed quantity, refer to the process where bids are invited from a variety of stakeholders for large projects that must be submitted within a deadline. Bidder with the lowest price “wins” contract and has the exclusive right for renewable electricity generation. Bids can take various forms (total investment appraisal, cost per unit of electricity). Though tenders seem to be a high-degree supportive scheme as it presents the highest cost efficiency, in practice it will be easily recognized that often tenders are accompanied with numerous problems. Intense price competition favors “large players,” something that opposes with the idea of clusterization and the general European direction regarding SMEs. Moreover, it should be underlined that the lowest bid is usually aligned with the cheapest technology, a situation that must be avoided especially for MRE projects. The fifth relevant category are bonds. Particular attention should be paid in the green bonds. As a conventional bond, a green bond (conceives also the blue growth concept) is a debt contracted for projects with an extended life-time, which are obliged to meet certain environmental qualities. What differentiates them is that in order to access the market of green bonds, time consuming compliance activities and some extra costs, mostly related with reporting activities, are required. By holding such asset institutional investors demonstrate their adherence to their own sustainability targets, reducing at the same time their exposure to MRE projects financial risks. The green bond market in Europe is yet a fraction of the international debt market. Total issuance of green bonds reached $120 billion in 2017 while global green bond issuance amounted of around $21 trillion. Compared, however, with the total amount allocated for climate-aligned universe ($696 billion) the amount of $120 billion corresponds to 17%; (Climate Bonds Initiative, 2017). Giant European energy companies have the monopoly of energy issuance. The Danish energy company Ørsted has passed to renewables (mainly offshore wind) from fossil fuels while many others are in a transitional stage, with funding provided stably by green bonds (Climate Bonds Initiative, 2018). Green bonds are typically for those who have an already tested experience in the market and are willing to pay over the odds. In case of MRE projects, if demand continues to increase ahead of supply, which is already a fact, it will inevitably lead to a pricing advantage for bond issuers. Benefits arising from the issuance of green bonds, not always tangible such as good reputation, can be identified through a careful examination of BE value chain. Lastly, tax incentives and other RES incentive schemes may act complementarily. Some countries, like Greece and Spain, provide tax incentives (tax deductions, accelerated depreciation) in order to encourage specific renewable energy technologies and stimulate investments related to RES projects. An in depth analysis including comparisons between these instruments and a meticulous evaluation of them using further criteria, like long-term competitiveness, governance and stability, can be found in De Jager et al. (2011). PELAGOS is co-funded under the Interreg MED programs by 85% from the ERDF and 15% from national resources (https://pelagos.interreg-med.eu) with a total budget of €2,396,104. The PELAGOS partnership is the following: (1) Centre for Renewable Sources and Energy Saving (CRES) (Lead Partner), (2) Hellenic Centre for Marine Research (HCMR)—Greece, (3) Italian National Agency for New Technologies, Energy and Sustainable Economic Development (ENEA), (4) Association of Chambers of Commerce of Veneto Region (UCV)—Italy, (5) University of Algarve (UAlg)—Portugal, (6) CTN Marine Technology Centre (CTN)—Spain, (7) Maritime Institute of Eastern Mediterranean (Mar.In.E.M)—Cyprus, (8) Toulon Van Technologies (TVT/PMM-TVT)—France, and (9) University of Zagreb, Faculty of Mechanical Engineering and Naval Architecture (UNIZAG FSB)—Croatia. PELAGOS brings all the necessary structural blocks of designing and running a cluster that offers services to beneficiaries along the Mediterranean BE value chain in a robust way. The PELAGOS BE cluster aims to identify common opportunities in the business, technological and socioeconomic fields and is integrated under the framework of the Transnational Cooperation Scheme. The cluster is composed of seven national clusters (HUBs), where each HUB consists by national key actors dedicated to R&D, innovation and policy including mainly SMEs, technology providers, researchers, start-ups and spin-offs, entrepreneurs, policy makers, large firms, regulatory authorities and NGOs. The services of the cluster in a national level are offered by the HUBs while the cluster orchestrates the national and transnational activities. PELAGOS partners are exchanging in a coordinated manner and define common objectives and plans of action. CRES, ENEA & TVT-PMM act as technical and scientific organizations that provide methodological, scientific and technical background during pilot activities, while UAlg, CTN, UCV, HCMR, UNIZAG FSB & Mar.In.E.M., TVT-PMM act as operational institutions through pilot implementation and provision of support services to all key actors in their national HUBs; see Figure 5. Figure 5. Roles of the PELAGOS partners. PELAGOS is preparing a suitable environment for cooperation and internationalization of the Mediterranean cluster and its members through the implementation of pilot activities at regional and transnational level. Certain services are provided from national HUBs in an attempt to stimulate MRE development in key market sectors by means of open innovation, strategic co-operations, MRE technology transfer activities and sharing of knowledge and experience. These services are summarized in Figure 6. Figure 6. Services provided by each national HUB to its members. Through these series of services, several opportunities may emerge in terms of intelligence, innovation, networking and business growth such as: capitalizing on and fine-tuning previous experience and knowledge of BE sector, coordination of pilot activities, development of skills and competences and identification of new business opportunities, provision of mentoring and coaching services, assessment of environmental impacts and preparation of social acceptance, construction of evaluating processes, techniques, models, tools, methods and services. As regards particularly SMEs, a path of successive actions, shown in Figure 7, with associated outputs is planned in order to promote innovation and extroversion. Among several duties, cluster coordinators have the responsibility for ensuring, over the long term, that the cluster will continue to be effective and contribute to the creation of additional value. Figure 7. Services provided particularly to the SMEs of each national HUB. The Greek HUB for Blue Energy (GH4BE) is coordinated by HCMR and is composed so far by 54 members representing all the actors of the Quadruple Helix model of Blue Growth. 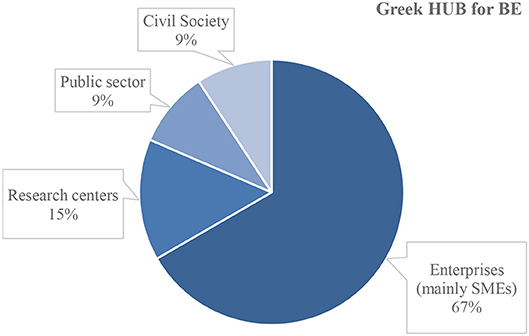 36 HUB members are enterprises mainly SMEs as the basic beneficiaries of the PELAGOS project, 8 are research centers and RTOs, 5 are public sector bodies, and 5 are civil society organizations (including NGOs and other clusters); see also Figure 8. The GH4BE ranks second in members among the national HUBs. Figure 8. Synthesis of the GH4BE. 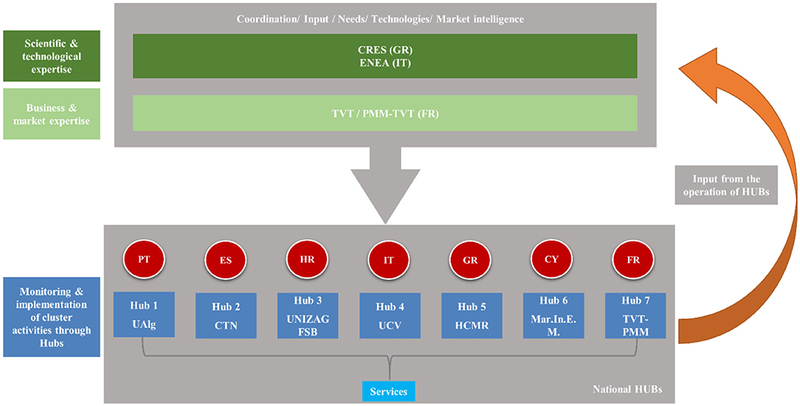 In a detailed elaboration and assessment of the innovation profiles of the SMEs members of the GH4BE, their innovation potential related to MRE systems exhibits a big variation from high to moderate levels but it is limited compared to services and software development. Lack of financing sources, limited extroversion and limited participation in EU co-financing projects are the main obstacles that have been identified throughout the existence of PELAGOS project. The majority of Greek SMEs offer consulting and software (applications) development services and only few of them design, operate and install equipment and systems related to BE. The innovation profiles of SMEs clearly depict the lack of actors involved in designing, manufacturing/constructing and installation of MRE systems, as only two actors have been identified from the interviews. Services such as consultation, software development and GIS consist the main occupation of the SMEs, presenting high innovation potential and Technology Readiness Level (TRL) 5-9. Regarding the Demand Readiness Level (DRL), this varies between 2 and 9, depending on the technology/services demands of each SME. The six SMEs that exhibit the most promising status based on quantitative (TRL, DRL) and qualitative criteria (tendency and willingness for collaboration, etc.) received coaching and mentoring services, which led to the elaboration of their BE Market Driven Innovation Plans. 1. Entrepreneurship and Technology Transfer: The philosophy for BE has been presented to the interested stakeholders. The fundamental role of research institutions was discussed and problems such as lack of funding and transferability of technological knowledge to SMEs were analyzed. The necessity for the establishment of European clusters experienced in BE and Blue Growth through success stories of viable start-ups was also endorsed. 2. Markets and MRE Technology Applications: The specifications and characteristics of MRE technologies and their application for the MS were presented and discussed. 3. Innovation soft-skills development: The positive results from the adoption of soft skills in successful businesses environments were discussed and justified through paradigms. Behavioral flexibility, adaptability negotiations, creativity, and eagerness to learn should formulate the actions for the sustainability of BE value chain. 1. Company Missions to End Users in Maritime Industries: HCMR scheduled six appointments with large entities in Greece, where SMEs had the chance to present their products/ideas, extend their business cycle, and receive recommendations. 2. Investor Ready Business Plans Through Mentoring and Pitching Services With Investors: A wide agenda of topics (economic principles, financial funding schemes, funding opportunities, etc.) were examined. Additionally, an investment plan is being suitably prepared for a Greek SME in order to answer the concerns of an investor demonstrating that the business is ready to implement the idea and the business goals and objectives. 1. Spatial planning, Coastal Zone Management, and Social Acceptance of MRE: These three important issues for the development of MREs in the MS were presented and analytically discussed. 2. Environmental Impact of MRE in MED Coastal Insular and Marine Areas: The positive effects and the impacts that MRE installations may have on the marine environment along with legal environmental issues have been presented. Furthermore, aiming at increasing the social acceptance of MRE and attracting industry's and investors' interest, HCMR has been involved in scientific, managerial and promoting activities. The GH4BE in an attempt to promote cross-cluster communication, fostered linkages with the Norwegian Blue Maritime cluster. HCMR also participated in the one of the biggest global maritime exhibitions (POSIDONIA 2018) looking for synergies with the maritime sector. GH4BE has created a close relationship with the Municipality of Piraeus, which currently is devoting remarkable efforts in launching a maritime cluster and is involved in Blue Growth. Moreover, HCMR promoted MRE research in the scientific community by coordinating the panel on BE during the 12th Panhellenic Symposium of Oceanography and Fisheries. The availability of natural resources in the MS that can be capitalized by the BE sector is more than sufficient to constitute a real impulse for the use of MRE technologies. However, if Mediterranean EU member states want to fully exploit the available potential, they should primarily commit to one specific and mature MRE sector. Specialization plays a substantial role in the successful exploitation of MRE while it explicitly contributes to the enhancement of value-added activities and smart strategies within the BE value chain, another crucial aspect for MRE development in the area. On these grounds, exploitation of offshore wind energy and the promotion of floating structures are considered the most rational choices. The most important problem in the area is the polymorphic landscape of the basin dealing with economic, social and geomorphologic aspects. Common issues that hinder the development of Blue Growth are vague competencies between national and local level, bureaucratic issues, inconsistencies between the involved ministries, and financing difficulties. In addition, complicated legislative frameworks prevent many investments. Unnecessary barriers related to permitting and approval mechanisms and processes, tax rebate, complicating governmental tender terms should give their place to a simple, clear and holistic process. Elaboration of new banking tools suitable for deployment of MRE at various stages should constitute a key role in the political agenda. Furthermore, allowance of public-based input and community buy-in to renewable energy projects is a contemporary bet that can be won. Therefore, the nature and key role of clusters within an economy should be comprehended and identified so that potential financial incompetence and hindrances to competitiveness and growth are diagnosed promptly and prioritized accordingly. In this work some tested tools and proven solutions are provided to cope with the aforementioned problems. A rational pathway is suggested for designing an efficient policy for the newly formed Mediterranean BE cluster. The proposed cluster policy is capable to further develop, enlarge and sustain the regional BE value chain based on legislative, innovation and financial policies. The Mediterranean BE cluster should focus on the unique sector-specific challenges, and institutional and coordinative issues, in order to be benefited from positive spillovers. Special emphasis is also put on the strategic position of SMEs in the cluster by promoting transnational/regional cooperation, share of knowledge and experience, and matchmaking activities leading to open innovation. PELAGOS cluster is being challenged to serve the aforementioned role, mobilize the involved stakeholders and form a solid BE value chain; on the other hand, national HUBs will also contribute (on their level) toward this aim. The overall anticipated impacts of the BE cluster are highly relevant to the innovation performance funded by supportive schemes and stable collaborations among the key actors that can bring new business ideas and products. TS conceived the work. TS, CA, FK, and AP wrote the manuscript with support from LS. All authors designed the work and contributed to the final manuscript. This work was supported by the Interreg MED Modular Project PELAGOS co-financed by the European Regional Development Fund and national contribution under the Funding Programme Interreg MED 2014–2020. Website: https://pelagos.interreg-med.eu/. The handling editor and reviewer RMP declared their involvement as co-editors in the Research Topic, and confirm the absence of any other collaboration. 1. ^The terms Blue Energy and Marine Renewable Energy will be used indiscriminately in this work. 2. ^United Nations Environment Programme. Available online at: https://en.wikipedia.org/wiki/Barcelona_Convention (Accessed Jun 29, 2018). 3. ^Cold ironing (ship electrification) is a procedure for providing electricity in ships while at berth. Cold ironing is an EU priority and the subject of the recently completed ELEMED project (https://www.elemedproject.eu/). 4. ^Note that in the past rich matrix of alliances and networking had been evolved within a small region between already tested and strong associations. Atkinson, R. D., and Audretsch, D. B. (2008). Economic Doctrines and Policy Differences: Has the Washington Policy Debate Been Asking the Wrong Questions? Available online at: http://www.itif.org/files/EconomicDoctrine.pdf (Accessed October 9, 2018). Bigerna, S., Bollino, C. A., and Micheli, S. (2015). The Sustainability of Renewable Energy in Europe. Cham: Springer International Publishing. Cointe, B., and Nadaï, A. (2018). Feed-in Tariffs in the European Union: Renewable Energy Policy, the Internal Electricity Market and Economic Expertise. Cham: Springer International Publishing. De Jager, D., Klessmann, C., Stricker, E., Winkel, T., De Visser, E., Koper, M., et al. (2011). Financing Renewable Energy in the European Energy Market. Final Project report by order of: European Commission, DG Energy. European Commission (2013). “European Commission guidance for the design of renewables support schemes,” in SWD(2013) 439 Final (Brussels: European Commission). European Sea Ports Organization (2016). Trends in EU Ports Governance. Available online at: https://www.espo.be/media/Trends_in_EU_ports_governance_2016_FINAL_VERSION.pdf (Accessed January 3, 2019). Food and Agriculture Organization of the United Nations (2016). “The state of mediterranean and black sea fisheries,” in General Fisheries Commission for the Mediterranean (Rome: Food and Agriculture Organization of the United Nations). Fosse, J., and Le Tellier, J. (2017). “Sustainable tourism in the mediterranean: state of play and strategic directions,” in Plan Bleu Paper (17) (Valbonne: Plan Bleu). Garbe, K., Latour, M., and Sonvilla, P. (2012). Reduction of Bureaucratic Barriers for Successful PV Deployment in Europe. Final Report of the EU PVLEGAL Project (2009–2012). Available online at: http://www.pvlegal.eu/results/status-reports.html (Accessed October 9, 2018). Jaegersberg, G., and Ure, J. (2017). Renewable Energy Clusters: Recurring Barriers to Cluster Development in Eleven Countries. Cham: Springer International Publishing. Piante, C., and Ody, D. (2015). Blue Growth in the Mediterranean Sea: The Challenge of Good Environmental Status. MedTrends Project. Porter, M. E. (2011). Competitive Advantage of Nations: Creating and Sustaining Superior Performance. New York, NY: Free Press. Ren21 (2014). Renewables 2014 Global Status Report. Paris: Ren21 Secretariat. Sörvik, J., Midtkandal, I., Marzocchi, C., and Uyarra, E. (2016). “How Outward-looking is Smart Specialisation? Results from a survey on inter-regional collaboration in Smart Specialisation Strategies (RIS3)”, in S3 Policy Brief Series, ed European Union (Luxembourg City: Publications Office of the European Union), 18–19. Steffek, J., and Romero, V. (2015). “Private actors in transnational energy governance,” in Challenges of European External Energy Governance with Emerging Powers, eds N. Piefer, F. Müller, and M. Knodt (Farnham: Ashgate Publishing Ltd.), 269–286. UNEP/MAP (2016). Mediterranean Strategy for Sustainable Development 2016-2025. Valbonne. World Travel and Tourism Council (2015). Economic Impact of Travel and Tourism in the Mediterranean 2015. Copyright © 2019 Soukissian, Adamopoulos, Prospathopoulos, Karathanasi and Stergiopoulou. This is an open-access article distributed under the terms of the Creative Commons Attribution License (CC BY). The use, distribution or reproduction in other forums is permitted, provided the original author(s) and the copyright owner(s) are credited and that the original publication in this journal is cited, in accordance with accepted academic practice. No use, distribution or reproduction is permitted which does not comply with these terms.